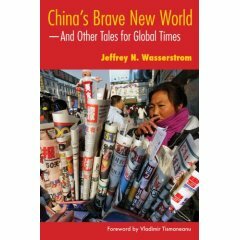 Episode Three offers a selection from Jeffrey Wasserstrom ‘s latest book, China’s Brave New World: And Other Tales for Global Times . Following a reading of the essay “Mr. Mao Ringtones,” Jeff speaks about how he came to write a book of ‘tales’ and offers his thoughts about American perceptions of China. Tune in next week for Part 2 of the podcast interview with author Jeffrey Wasserstrom. This entry was posted in books, history, podcast, writing and tagged Asia, author, China, China Beat, globalization, Jeff Wasserstrom, podcast, travel, travel writing. Bookmark the permalink.